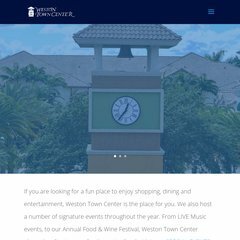 Topics: Weston Florida Shopping, Weston Florida Dining, and Weston Florida Events. The estimated 94 daily visitors, each view 13.00 pages on average. campintegrations.com Camp Integrations! Building Skills for Fun and Friends! It has 2 DNS records, ns1.bluehost.com, and ns2.bluehost.com. It is hosted by Bluehost Inc (Utah, Provo,) using Apache web server. Westontowncenter.net's server IP number is 67.222.60.89.